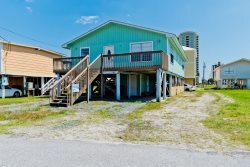 5BR/3BA just one block from the beach. Perfect vacation rental for two families! Shore Duty Five is a 5BR/3BA condo, approximately 2700 square feet. It is located just one block from the Gulf of Mexico and is the perfect size for a family retreat or gathering of friends. It is large enough to sleep up to 14 people (8 upstairs / 6 downstairs), with plenty of room to spread out. There are tile floors in main traffic areas and carpet in bedrooms. The downstairs master bedroom has a king bed with a full private bathroom. The other two downstairs rooms have queen size beds and share a bathroom in the hallway. The spiral staircase leads you to the loft area. One side of the loft has a twin/full bunk bed and a full size bed. On the other end you'll find a twin trundle bed and another twin bed. There is a shared bathroom between the two areas in the loft. All bedrooms come equipped with TVs and DVD players. The living room offers a 55” big screen TV, DVD player and leather furniture with a sleeper sofa with room to wind down after a fun-filled day at the beach. In the high-ceiling kitchen you'll find a large Gulf view window with an island that seats six, and a large open dining area with seating for eight. The private balcony facing The Gulf of Mexico is perfect for morning coffee and picturesque sunsets by evening. Don’t forget about the pool located just downstairs to lounge around all day. If grilling is something you enjoy, feel free to throw on some steaks or burgers while you're down at the pool relaxing. If you have any rainy days during your stay, enjoy shopping, entertainment and great seafood restaurants, all just minutes away. If you are looking for an affordable upscale beach getaway, this unit is a real value! Book today and enjoy some special family memories and get ready to relax...You are now on SHORE DUTY! Note: This condo is accessible by stairs only. There is no elevator. Keiths place was perfect for our family of 9. The kitchen was well stocked, location was great, the place was clean, check in and out was a snap. Loved our stay! Enjoyed the space! Thanks for having us! Our stay in the unit was wonderful we had a great time. Would highly recommend for family vacation or any large group,not far from beach and a pool on property. My family and I came for a vacation and this was much more than we expected. Very clean, spacious and literally had everything furnished and stocked that we could think of. There were 16 of us and two toddlers and we all were very comfortable. I would recommend this place to anyone. Place is just like everyone says - it is huge once you get in. Great space - works well for larger groups. My wife and I hosted our son and his 6 friends everyone had a bed and lots of space to spread out. You can see and hear the ocean as it is just across the street. Nice location and would stay here again. The condo was absolutely breath taking when you walked in the door. Everything was so clean and neat. Our first experience at gulf shores was great all because of the condo. The 2nd day my little one got stung by a jelly fish in the ocean, so with the pool that was provided was great because we got to go to the beach and enjoy watching the waves and then head back and let the kids swim. Overall experience was amazing. Great condo for large family Left on Jun 20, 2017 for a stay in Jun 2017 This was a great space - room, amenities and location. Just a short walk to the beach, nice pool below and plenty of space for a large family. Could not have asked for anything better. It was absolutely perfect !! Our family had a Great time and loved where we stayed, was just perfect, definitely recommend to anyone! Close walk to beach, very roomy for a big group. Just Perfect. Thank you so much! Beautiful facility!Very clean and maintained! Yes Indeed we would come back again. Keith, We sincerely appreciate you letting us stay in your home. Your home is very lovely and spacious! Again we apologize for the parking issue that occurred. You may want to revise the message that was on the fridge. I assume it's for all tenants in the condominium. Upon arrival one may be slightly worried about space. But I can guarantee this home is a lot larger than it appears and rather beautiful. With just a short walk to the beach! The owner was very easy to get in contact with. He also had a maintenance person on site regularly to make sure everything is running smoothly without interference of its occupants. However neighbors can get rather angry & rude when you park in the unmarked spaces so you have a two car maximum unless you want to park in public parking and walk to the condo. This place was clean and had a beautiful view of the ocean! It was a perfect place for our family vacation! This place was just perfect for our family! Beautiful place, wonderful location, accommodation was good for 12 people. One negative is the need to wash "all" towels before leaving. That was a minor inconvenience. We had a big family gathering for new years. The house was well equipped to handle us. Keith was great to work with! Loved Shore Duty! We had plenty of space for our grown children and grandchildren. Kids loved the two loft areas! Kitchen is so big. I loved that we could sit around the farm table and use the kitchen island. View of beach from loft window was a great surprise! We enjoyed sitting on balcany facing the beach each morning. We ended each day out there all together. Our time at shore Duty was so much fun we have already booked our return trip for next summer 2017!!! Our family of 13 recently enjoyed staying in Shore Duty 205 while we celebrated our 40th anniversary. We loved the open layout, huge well-stocked kitchen, and close proximity to the beach. The grand children loved the loft areas, and greatly enjoyed the pool located directly below our unit. We appreciated the clean, updated bathrooms, and luxurious appointments in both baths and bedrooms. The decor was first rate and beautiful. Keith responded quickly to all questions directed his way. We just had a wonderful stay at Shore Duty 205, and would definitely recommend it to any family needing a spacious, lovely place to stay in Gulf Shores. We stayed 6 nights this past week for a family reunion. We had children ranging from 1 1/2 yrs old to teenagers. Keith answered all our questions prior to our arrival in a very timely manner. The place was very spacious and layout worked well for our extended family of 14. The kitchen was well stocked to cook meals. Two charcoal grills just outside by the pool allowed us to grill a couple meals while the kids used the pool after being at the beach. Beds were very comfortable and bathrooms very clean and updated. Large living room allowed family to stretch out and relax after visiting family and beach during stay. Beach access is right across the street. Balcony facing the beach allowed for relaxing morning coffee and evening relaxation. Stores and restaurants are nearby. We had a great stay and would definitely recommend Shore Duty 205 to others! Keith was always friendly and easy to work with. Very prompt with replies to any of my needs. We really enjoyed our stay with extended family and friends and would recommend it to others, everything was clean and great and the staff was super friendly! Loved the property. Spacious and exactly what we needed. Great property for families with children of all ages. Will stay there again when we return to Gulf Shores. My family needed a much needed vacation and we stayed at Shore Duty for an entire week. I was very impressed with the pictures online, but I can honestly say the pictures don't do this place justice. This place was so big!!! The kitchen was huge and you could host at least 15 people for dinner and be very comfortable. My wife has a lot of family in Biloxi and we did have a dinner for 13 and everyone was blown away with how nice and spacious this place was. Being a man, I loved the huge TV in the living room with DVD players all over the condo. The master bedroom/bathroom blew me and my wife away. I could lay in bed and look out the window and see the ocean. I could go on and on, but I think you get the point. The owners have made sure this place has everything you need plus some! I will be back next year!!!! If you're wanting a relaxing vacation, this is your place. For a week, I felt like a high roller. The only bad experience was having to leave. This was just our Second Annual Family Vacation and this place made it by far better than last years. With very little time to plan, since my parents did not give us kids lots of time, we were having a difficult time finding a place that could house 13 people. We initially wanted to go to Pensacola, FL but ended up in Gulf Shores and let me tell you, we are all glad we did. This house was everything we could have asked for except for not being right on the beach. This is why we give this house a 5 star rating. We knew going into it that it was a block away and even with that, it was not bad. We were able to cook and all be in the kitchen at the same time. As a matter of fact all the grandkids would sit and eat on the island while the adults took the table. The kids loved the loft and thought it was very cool. Overall, if you are looking for a place to be and have kids with you, this is it. We are already making plans for our next vacation and are seriously considering this house again. We had a bunch of men down for golf trip. Place was clean, had plenty of room, & we really enjoyed our stay. Would recommend it for groups or families for beach vacation.